For those of us with sensitive teeth and gums, choosing a toothpaste isn’t as simple as grabbing the cheapest option off the shelf. The wrong toothpaste can exasperate the problem and increase pain in the gums and teeth. Sensitive teeth can cause pain and discomfort triggered by hot, cold, sour or sweet foods and drinks. If you struggle with tooth sensitivity, choosing the right toothpaste can allow you to enjoy your favorite foods and drinks without discomfort. Sensodyne is arguably the top name in sensitive tooth care today. Specially formulated for sensitive teeth and gums, their toothpastes include special desensitizing ingredients to decrease pain and discomfort. Their Pronamel line includes ingredients to strengthen enamel that has been weakened by acid and plaque buildup. Because inadequate enamel protection is the primary cause of hypersensitivity, this is the most effective way to treat sensitivity. Sensodyne Pronamel uses a number of ingredients to protect sensitive teeth while gently whitening for a bright, healthy smile. The first ingredient listed, potassium nitrate, is known for treating hypersensitivity by blocking pain receptors. This provides immediate relief while the other ingredients, including sodium fluoride, work to treat the source of the problem. Sodium fluoride provides double benefits by protecting against cavities and “re-mineralizing” damaged tooth enamel. Sensodyne states that it does not replace lost enamel – once enamel is gone, it’s gone for good. Instead, it strengthens remaining enamel to prevent further erosion. To gently whiten teeth, Sensodyne Pronamel’s whitening formula includes ingredients like hydrated silica. Hydrated silica is an abrasive which helps to gently buff away plaque and stains from the surface to reveal whiter teeth. Users consistently reported that their teeth were noticeably whiter after consistent use. Since the whitening ingredients are gentler and less concentrated than harsh whitening products, don’t expect a bleach-white smile – but you can expect your teeth to become a shade or two whiter. On top of the ingredients it does include, it’s worth noting the ingredients it doesn’t include. Sensodyne does not include sodium lauryl sulfate, or SLS, which can lead to canker sores and irritation. SLS has been linked to allergies and sensitivities in some users. It acts as a surfactant and is included as a detergent in toothpaste to remove stains and residue. SLS is responsible for the “foaming” action that you see when you brush your teeth. While many people do not notice adverse effects from the use of SLS, it can cause problems in those with existing sensitivities. Reviews on the taste varied from user to user. Generally, it was described as “mild” and “minty fresh,” although a few users thought it to be somewhat unpleasant and medicinal-tasting. One user described it as “horrible,” but said that the benefits of this toothpaste far outweigh the taste. For the most part, reviews on the taste were fairly neutral and came down to personal preference – you’ll have to try it for yourself to decide. In terms of effectiveness, users were widely impressed by this toothpaste’s ability to eliminate hypersensitivity in their teeth. 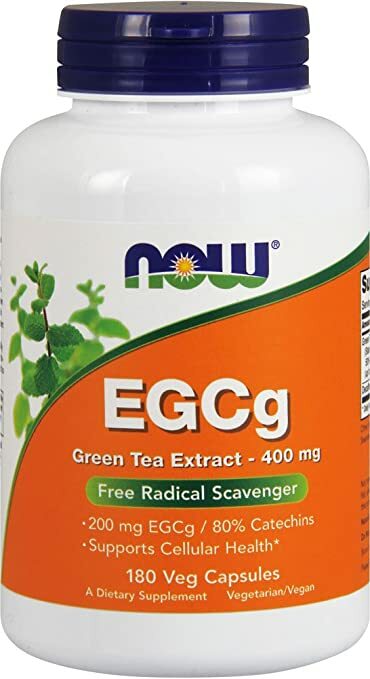 One user in particular who was suffering from a cracked tooth said that this was the only product that helped her to minimize the pain while waiting for medical treatment; she even said that it brought her pain level from “a 10 to a 1.” Other users suffering from normal hypersensitivity said that within a week of regular use, they were no longer sensitive to hot/cold food and drinks and their gum bleeding had been reduced or eliminated completely. Amazon offers a few different packages for different prices. A 3-pack of standard-sized 4.8 ounce tubes can be purchased for $15.51. Considering its top consumer ratings and countless recommendations from dental professionals, this price is very reasonable especially when compared to regular retail prices. 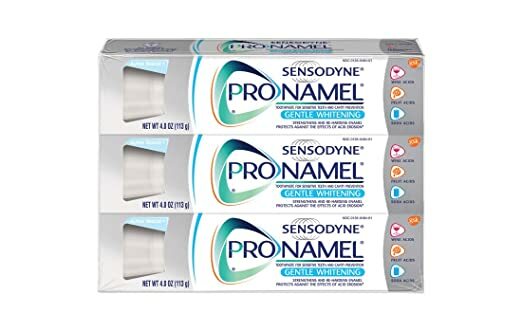 Out of over 800 reviews on Amazon, 91% came in at 4 stars or higher to earn Sensodyne Pronamel an overall 4.7 out of 5 stars. Users who love it said that they can never go back to their old toothpaste, as this formula provides exceptional relief quickly and effectively. Rave reviews from consumers and critics alike have earned Sensodyne Pronamel our top choice as Gold Pick. Colgate is another giant in the oral health industry. With product lines specializing in a number of issues, ranging from gum health and tartar control to whitening and sensitivity relief, there’s a Colgate product for everybody with teeth. Their Sensitive Prevent & Repair toothpaste is made to combat the damaging effects of acid on enamel to promote healthier teeth with less sensitivity. Active ingredients potassium nitrate and sodium fluoride help combat sensitivity by blocking pain receptors and protecting enamel from wear. When compared with Sensodyne, the active ingredients are the same; the only difference is the concentration of sodium fluoride. Colgate’s formula actually contains a slightly higher percentage of sodium fluoride (0.24% versus Sensodyne’s 0.15%). The presence of sodium fluoride prevents cavities while promoting strong, healthy enamel. It is worth noting that, unlike the Sensodyne formula, this toothpaste includes sodium lauryl sulfate (SLS). Hydrated silica polishes and scrubs the surface of the teeth to remove surface stains and reveal a whiter smile. While users said that it didn’t provide the same whitening effects as harsher whitening strips, many said that they noticed a slight difference in the brightness of their teeth. The taste was described as overall pleasant and like that of any regular mint-flavored toothpaste. Users who had tried and disliked the taste of Sensodyne said that they were much more pleased with the taste and texture of Colgate. After using, reviewers said their mouths felt truly clean and their breath stayed fresh for hours. Users reported significant relief in sensitivity with regular use of Colgate’s sensitive formula. Many compared it to Sensodyne or prescription toothpastes with positive results. For people who were previously unable to enjoy cold or acidic food and drinks, Colgate Sensitive provided much-needed relief. One user in particular said that this was the only toothpaste that ever provided relief for her extremely sensitive receding gums. A 6 ounce tube of Colgate Prevent & Repair can be purchased on Amazon for $7.95 ($1.33/ounce), putting it in a standard price range for other toothpastes of its class. 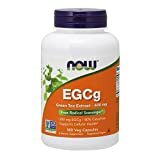 90% of Amazon reviewers rated this product 4 stars or higher for an overall rating of 4.6 out of 5 stars. The same company that brought you the baking soda in your cabinet also creates a toothpaste specially formulated for sensitive teeth. Arm and Hammer is known for including baking soda as an ingredient in their toothpastes, which has a number of benefits from whitening to fresher breath. For users with sensitive teeth and gums, Arm and Hammer’s sensitive whitening formula provides the benefits of baking soda with desensitizing ingredients. This sensitive toothpaste was created by the makers of Orajel, a company that specializes in toothaches and tooth sensitivities of all kinds. Industry experts from Orajel and Arm & Hammer collaborated to create a toothpaste that caters to those with teeth that are sensitive to acid and cold or heat. Like most sensitive toothpastes, this toothpaste makes use of potassium nitrate for sensitivity relief and sodium fluoride to prevent cavities and promote enamel health. Arm and Hammer also includes sodium bicarbonate, more commonly known as baking soda. Baking soda is known to have a number of positive effects when combined with toothpaste, including polishing and whitening the teeth and freshening breath. It also acts as a gentle abrasive to scrub away surface stains over time. Similarly to Colgate’s version, Arm & Hammer’s sensitive toothpaste includes SLS. While this doesn’t necessarily mean it should be avoided, those with extreme sensitivity or allergies should take care to monitor their reactions to this toothpaste. Unlike the previous two sensitive toothpastes, Arm & Hammer’s primary whitening agent is baking soda. It does contain hydrated silica for additional whitening, but many users said that they experienced a noticeable difference in whitening from the use of this toothpaste versus competitors. Some described their teeth as looking almost as if they “glowed” after using this toothpaste. Others said that they were able to achieve a “pearly white” finish with the use of this toothpaste alone – no harsh whiteners needed! If you’ve ever accidentally gotten a clump of baking soda in your mouth, you know how it tastes: bitter, salty, and downright unpleasant. However, the majority of users said that this toothpaste had a fresh, subtle flavor with no noticeable baking soda taste. Many admitted initial reservations, thinking that it would taste salty or bitter, but almost all reviewers were pleased to report that the taste was much like that of other toothpastes. Reviewers enjoy the classic, fresh clean that they are able to achieve with regular use of Arm & Hammer’s sensitive toothpaste. Many reported excellent whitening results as well as alleviated sensitivity. The inclusion of baking soda was commented on by a majority of users, who said that it seems to make it easier for their toothpaste to get into the hard-to-reach crevices between teeth. A 2 pack of standard 4.5 ounce tubes can be purchased on Amazon for $11.14 (about $1.24 per ounce), putting this in the same price range as most of its competitors. 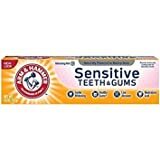 With an overall rating of 4.7 out of 5 stars on Amazon, Arm & Hammer makes one of the most reliable and popular sensitive toothpastes on the market today. Crest toothpastes have probably been on your shelf at one point or another in your lifetime. It seems to be a go-to brand for oral health, and their reasonable prices make them highly accessible. 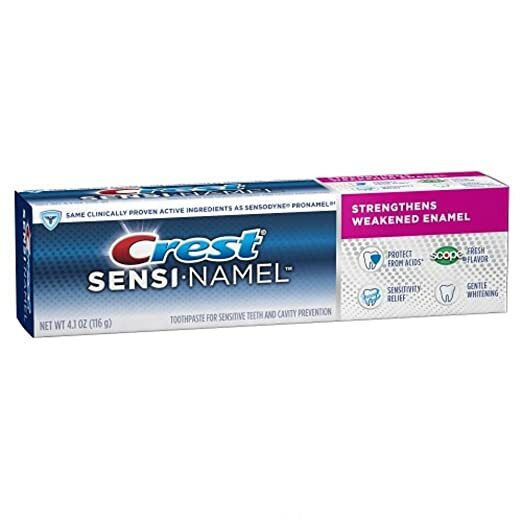 The Crest Sensi-Namel formula was created with the same clinically proven ingredients as Sensodyne’s ProNamel formula to provide similar results at a lower cost. 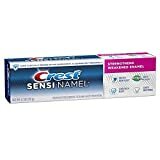 Like the previous toothpastes listed, Crest lists potassium nitrate and sodium fluoride as the active ingredients in this toothpaste. These ingredients alleviate tooth sensitivity by blocking pain receptors and promoting enamel strength for short and long-term relief. As with most whitening toothpastes, hydrated silica is included to provide an abrasive substance for scrubbing away surface stains. Crest is known for their advanced whitening systems, which provide a cheaper alternative to professional whitening treatments. However, their line of more intense whitening products – including the Crest 3D system – tends to include ingredients that may be irritating to those with sensitive teeth. Many users reported that this toothpaste on its own was enough to provide a reasonable amount of whitening without increasing sensitivity. Most reviewers enjoyed the taste and texture of this toothpaste. Some noted that it feels a bit “grainy” in the mouth, but did not find it to be too unpleasant. Any grit or graininess is most likely the result of the hydrated silica as it needs to be somewhat gritty to scrub away stains. The taste was described as very fresh and minty, but not overwhelmingly minty like some other brands. It includes the fresh taste of Scope mouthwash to create a pleasant, long-lasting flavor. Many reviewers commented that they purchased this toothpaste as a cheaper alternative to Sensodyne as it contains virtually the same ingredients at a fraction of the cost. The majority of users said that the results they achieved with Crest’s version rivaled the results they had with Sensodyne, although a few reported that this formula actually increased their sensitivity. The most notable difference between this toothpaste and Sensodyne’s is the inclusion of SLS which, as noted, can cause increased sensitivity and canker sores, amongst other problems. A 4.1 ounce tube can be purchased for only $4.99 at most retailers, making this the most cost-effective sensitive toothpaste on our list. Out of a whopping 3,682 reviews, it received an overall rating of 4.4 out of 5 stars on Amazon. The principal purpose of a toothpaste is to provide protection against plaque and cavities. No matter how gentle the formula, a toothpaste is essentially useless if it offers no cavity protection. Fluoride is the primary ingredient that fights plaque and cavities – make sure it’s one of the active ingredients in any toothpaste you choose. When you’re looking for a solution to sensitive teeth, keeping an eye on the ingredients in your toothpaste is essential. Take a look at the ingredients panel on any toothpaste you’re considering. First things first, look in the active ingredients for potassium nitrate or strontium chloride. These chemical compounds block the pain receptors attached to nerves inside the teeth to provide immediate relief against sensitivity and pain. In addition, the active ingredients should include fluoride or sodium fluoride to strengthen enamel and prevent further erosion. Since insufficient enamel is the primary cause of sensitivity, this is a crucial ingredient. Also keep an eye out for certain ingredients which may actually have adverse effects. Although many people use it with no problems, sodium lauryl sulfate (SLS) can lead to canker sores, mouth ulcers and other oral health risks. Those with especially sensitive teeth should opt for a toothpaste free of SLS when possible. We all love the idea of a brighter, whiter smile. Many traditional whitening solutions use harsh chemicals that can create or intensify painful sensitivity in the teeth. Professional whitening is often expensive and uses the same harsh ingredients as at-home whitening. Oral care companies have advanced their toothpaste formulas to whiten teeth without the inclusion of bleach or other harsh chemicals. The result is a sensitive toothpaste with the added benefit of a whiter smile. While a toothpaste might not yield the same extreme results as some traditional methods, many people report noticeable brightening with regular use of a whitening toothpaste. Although taste shouldn’t be the primary factor in choosing the right toothpaste, it should definitely be considered. Experts recommend brushing teeth twice a day for about two minutes per session. If you absolutely can’t stand the taste of your toothpaste, you’ll dread brushing time. Choose something with a taste that leaves your mouth feeling fresh and clean, and one that doesn’t make you want to skimp out on brushing time. There’s a reason Sensodyne is the most popular name in sensitive toothpaste. Clinically proven ingredients deliver real relief for people suffering from teeth that are sensitive to heat, cold, and acidic foods or drinks. Sensodyne is one of few oral care brands that does not include SLS in their products, making their toothpaste ideal for users with sensitive teeth. Users with mild to extreme sensitivity – even receding gums and exposed nerves – reported fast and effective relief. On top of that, hydrated silica works to gently whiten the teeth for a brighter smile. This all-in-one product earned our Gold Pick for its top-rated consumer reviews, clinically proven results, and superior ingredients.